An excellent video report from Global Uprisings and Brandon Jourdan of the Vio.Me. factory occupation in greece. Any revolutionary movement will inevitably confront the issue of production. In radically changing capitalist society, how can the basic needs of people be met? Excluding the scenario of a dramatic overthrow of the system (whatever that might mean), any change will be partial and slow, or its extent and pace will be at least unpredictable. The issues, problems and questions of the Vio.Me. workers are therefore fundamental. But so too is their courage and lucidity. The workers at the Vio.Me. Factory in Thessaloniki, Greece have quickly grown into a symbol of self-management internationally. After going on strike and occupying their factory, on February 12, 2013 they re-opened the factory and started production under worker’s control. 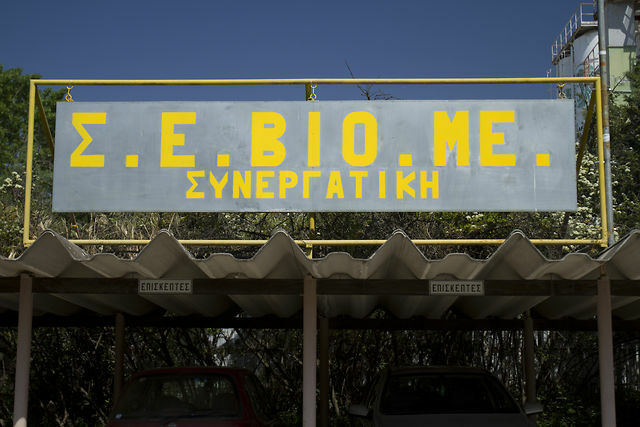 For many, the factory represents a new potential way forward for unemployed workers in Greece – seizing the means of production, running factories without bosses, producing only goods that are needed, and distributing them through solidarity networks. This entry was posted in Commentary, Film, News blog and tagged Factory Okupations, greece. Bookmark the permalink.